The sacrament of Reconciliation is one of the healing sacraments (the other healing sacrament is Anointing of the Sick). Reconciliation is a beautiful Sacrament in the Catholic traditions which repairs our relationship with God and neighbour from the self-inflicted damage of sin. Sin can be understood in different ways. One understanding of sin is ‘missing the mark’. We are created in God’s image and John the evangelist says ‘God is love’ (1 John 4:16). To be the image of God means to love, to give of ourselves for the good of others. When we fail to love we ‘miss the mark’. By sinning we go against our very nature, we were created by love to love. The reason we can fail in our duty to love is due to Original Sin. Original Sin is a weakness in our spiritual and moral lives which was passed onto us from the first human beings. The fall of Adam and Eve came about when they started to doubt God’s love for them. They began to see God as a competitor for their happiness and so they took the forbidden fruit from the tree out of selfishness. The first humans tried to take by force rather than receiving every good from God as a free gift. This first act of selfishness was passed down throughout humanity. Original Sin describes the fallen state of human nature which affects every person born into the world, and from which Christ, the ‘new Adam’ came to redeem us (Catechism of the Catholic Church, pp 396-406). a person freely chooses to do the sinful act anyway (full consent). The good news is God has given us the remedy to repair the damage done by sin with the Sacrament of Reconciliation. This sacrament is known by different names which are taken from the various parts of the sacrament. 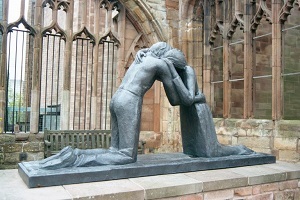 It is known as ‘confession’ because in the sacrament a penitent confesses their sins, the evil acts they have done and/or the good they failed to do. The sacrament is also known as ‘penance’ because there is always a penitential aspect of the sacrament. Penance is not a negative word. Penance is a concrete action (often a prayer) which helps turn our heart back to God and neighbour. Finally this sacrament is known as ‘Reconciliation’. This is the most appropriate name for the sacrament because it encompasses the whole sacrament and the reason Christ gave it to us, that is to be reconciled with God and our neighbour. Why go to a priest for forgiveness, can’t I just talk to a friend? Yes, you can talk to a friend and this may help, but Christ gave the power to forgive sins to the Apostles in the upper room after His resurrection (Jn 20:22-23). The Apostles passed this power onto the first bishops and as the faith spread bishops passed this power onto priests who help the bishop in his ministry. In fact, in reality during the sacrament of reconciliation penitents are confessing your sins to Christ who works through the priest. Christ is the one who absolves and forgives. Only God has the power to forgive sins and he shared this power with His Church so that people would be freed from the slavery of sin. Start with a pray to the Holy Spirit, inviting Him into your time of preparation. Meditate on God’s love for you and how He wants to draw you to the fullness of life. Reflect on your relationships (God and neighbour). Is something not right? Read through the Ten Commandments or examination of conscience questions. Acknowledge your sorrow for your failures and ask the Holy Spirit to help you make a good confession. What if it’s been a long time since my last Reconciliation? Going to reconciliation can be daunting, even for those who go to the sacrament regularly often feel unsettled. It is difficult to acknowledge one’s failure and weakness. If you are thinking of going to reconciliation God has probably put this on your heart. Don’t be afraid to follow this prompting, it always leads to freedom. If you don’t remember the procedure or the prayers the priest will walk you through the sacrament. The only things you need to bring to the sacrament are: sorrow for past sin, a desire to change for the better, and a trusting heart. Reconciliation is offered at our church on Saturday 11am to 12pm and 5pm to 6pm. If you would like more information about this sacrament of healing or would like to set up a time for reconciliation, please contact one of the priests on 9310 1747 or contact us here.